3 things you can do today to cure it and multiply your communication efforts. Many people think that social media marketing is easy and that anyone can do it. That’s why many companies still use their interns to publish on Facebook or LinkedIn. Every day, I see dozens of examples of social media publications gone wrong. From a Facebook personal account used by a company (yes, in Argentina, it is still very common!) 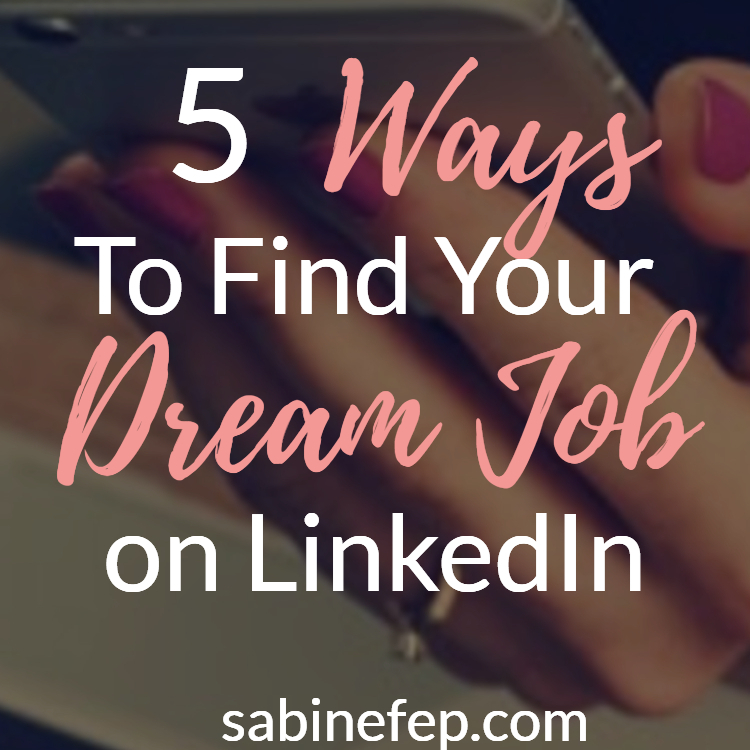 or a LinkedIn account with the name of the company instead of the actual contact name, which defeats the whole point of LinkedIn. If you search online, you will find tons of “how to” guide on social media but how do you know if it is right for your business? By the time you read them and implement their advice, how do you know that they are not already out of date? There is ONE thing that is not going to change and it is what you communicate to your audience, no matter the platform! 1 – Add a blog section to your website and make it the “go-to” source of information on the subjects you are most passionate about. Social Media platforms should not be used to develop new ideas but are the vehicle of those ideas. As Twitter defines itself, it is an information network and not a social network. Although conversation is still happening on Twitter, it has now become a place to share your ideas meanwhile the conversation has shifted to Facebook! – recommend your own or other people’s products or services. In a nutshell, it will be a place that you fully own and manage. 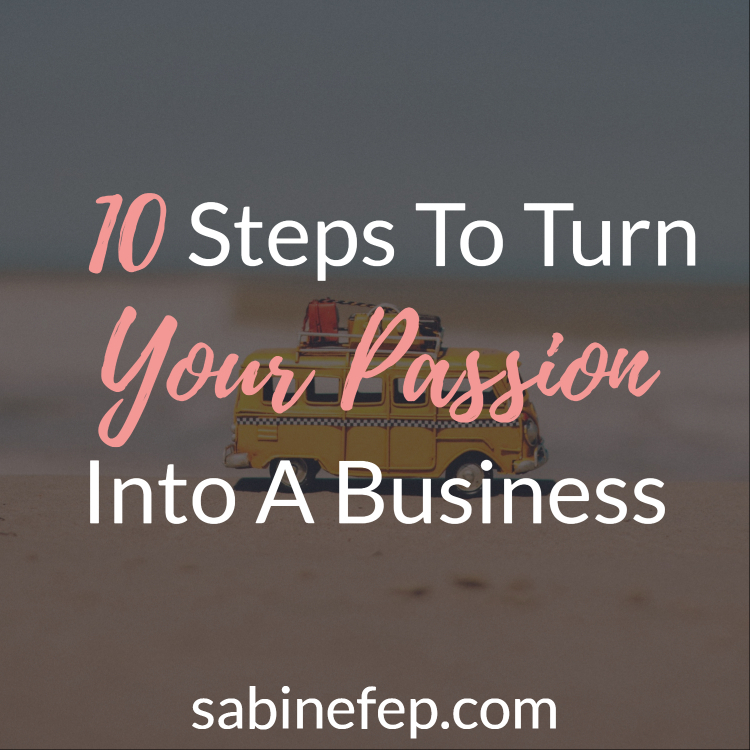 However, to be able to totally own it and manage it, you will need an action plan for your business. Failing to plan is planning to fail, they say. Well, I don’t like using cliché but this is true and even more so with blogging and using social media. This is where the new shiny object syndrome comes into play. It affects us all, whether we are new online or a seasoned online business owner. The strongest cure for this is planning. We are all tempted to try new social platforms, especially if all our friends are talking about. As mentioned in a previous post on productivity, I strongly recommend that you plan all your marketing actions before each day and even better at the beginning of each week. Let me give my own example: it took me nearly a month to formulate my own schedule as I had to try and see what worked best for me. 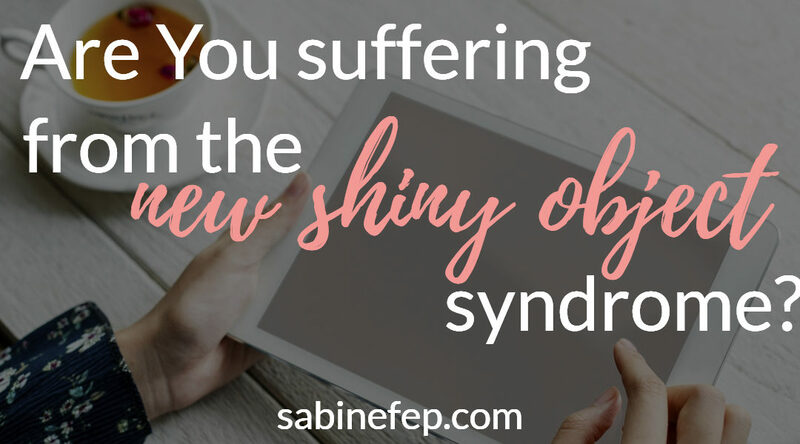 This way, I don’t get sidetracked by shiny new objects (whether it is a new social media, a new marketing system or a new guru) on the days when I am not meant to spend time on it. It still isn’t perfect as sometimes I have to skip a day due to unforeseen activities but I always try to make up for it the following day. Top tip: Once you’ve created your weekly planning schedule, stick it on your wall or better, place it as a background image on your desktop, that way, every day, you’ll know exactly what you will need to be working on. 3 – Make advantage of online tools to help you communicate better and more efficiently. So my first advice is to concentrate on the minimum number of platforms to avoid confusion. Another risk of the new shiny object syndrome is to create an account for every social media out there and then fail to keep them active. Rest assured that very soon, you’ll feel overwhelmed by it all! So choose one or two platforms where you are the most likely to find people interested in your blog. My second advice is to use an online tool to help you plan your communication ahead. This way, you won’t need to spend a lot of time on social media each day. 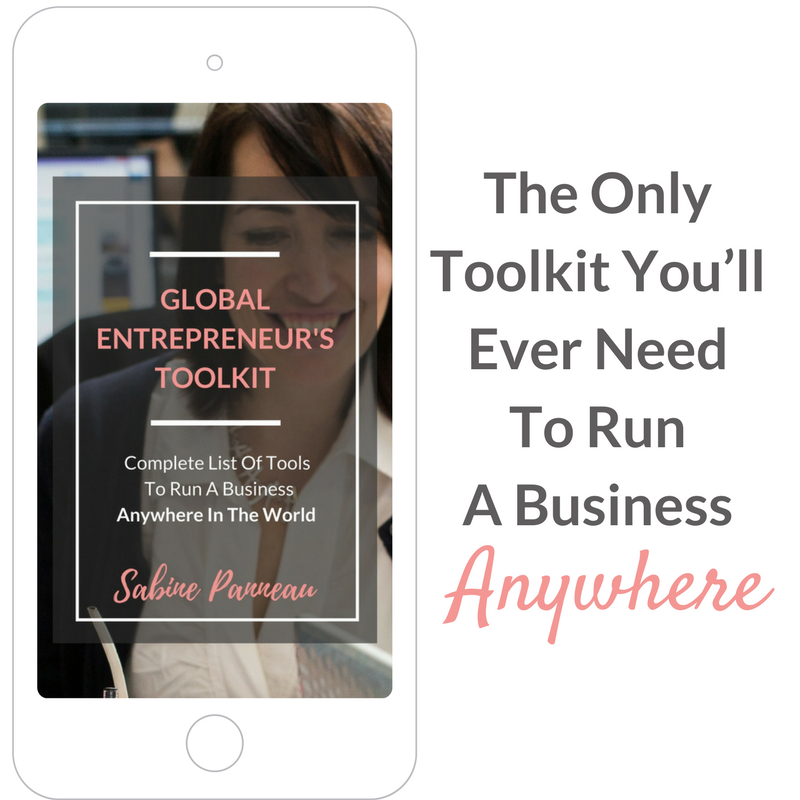 For this, there are many online tools such as Hootsuite or Buffer that you can use to share your blog posts and communicate to your followers and readers. But again, I don’t want to give you more stuff to get sidetracked with so I will only concentrate on just one tool here. 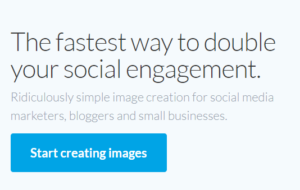 It’s called Buffer and it defines itself as a smarter way to share on Social Media. 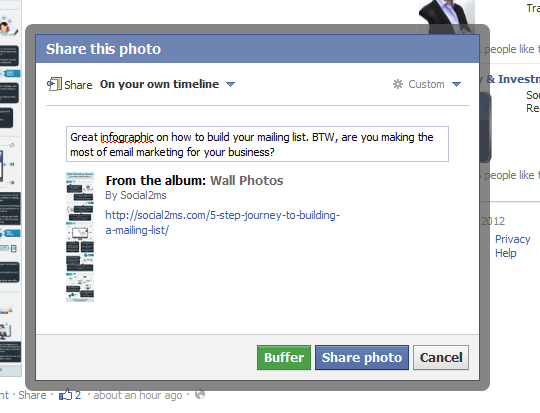 Buffer makes it super easy to share any link or page that you’ve just read. In essence, what it does is to place your updates/links in a queue and they will be published on the corresponding social media platform at a set time. You choose the timings, the platforms and the order of appearance. 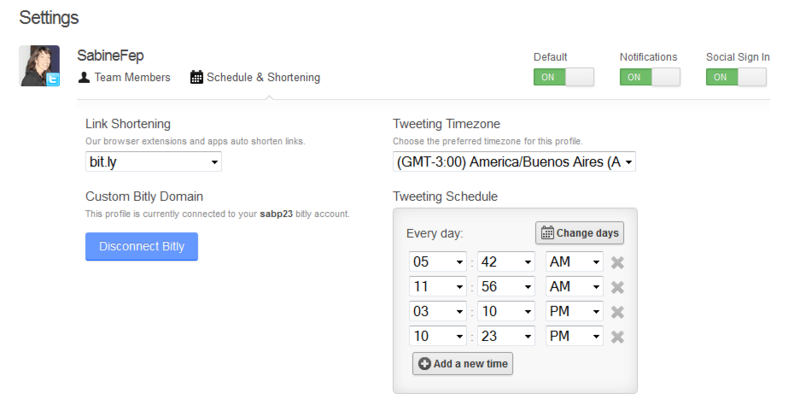 For instance, if you want to tweet 4 times a day (as shown on the image below) and send 2 status updates on Facebook you can set the timings of each posting, you decide on which days of the week they will go out. Then, all you will have to do is to start adding new posts/statues/links to the queue whenever you find something interesting you want to share. It also comes with some useful apps which means that within Facebook, you will be able to use Buffer to add to the queue using the traditional share button (see image below). The great thing about buffer is that you can prepare all your week’s updates in advance for each of the 3 following social platforms – Facebook, Twitter and LinkedIn. If you want to add more accounts, you can always sign up for their premium offer. 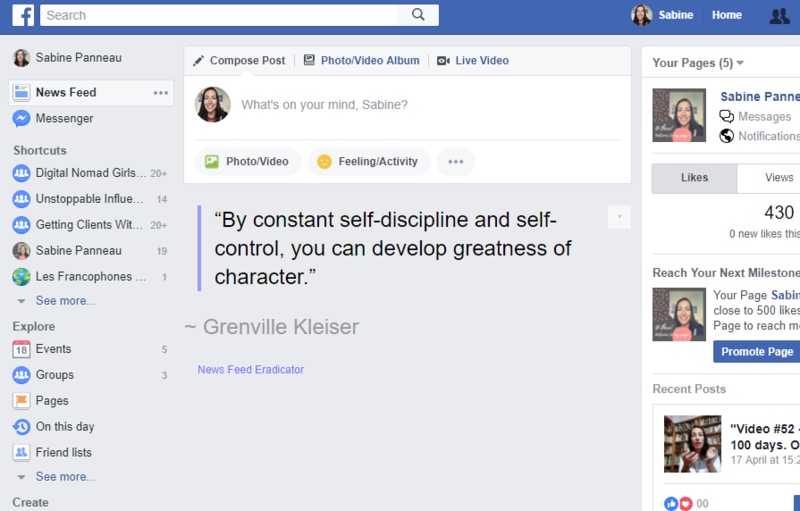 Another tool that I use and which is helping me a lot is the browser extension or add-on: Facebook Newsfeed Eradicator. As you can see I get a nice quote instead of the hundreds of status updates from my thousands of contacts and page likes. No more distraction and scrolling down for hours. It means that I can go straight to my personal page, business page or my groups without wasting time anymore. And don’t worry, you still get the notifications from my friends and events you’re going to, etc. This is without a doubt the best productivity hack that I have been using in the last few years! 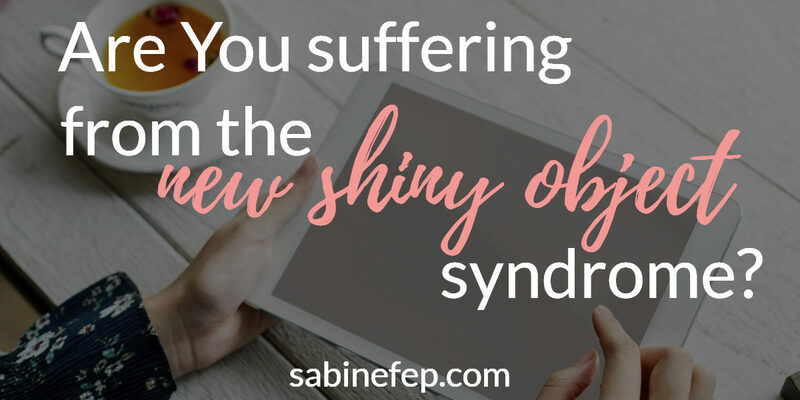 So, do you feel like that you can cure your new shiny object syndrome? What is your current biggest obstacle when it comes to interacting on social media platforms? Need some help? Yes, to answer your question! I’ve been hosting my wordpress site for a couple of years. My visits and interactions have increased drastically over the last 12 months but I find I’m constantly looking for the next “shiny” thing. I don’t believe I can get more connected, lol. I’ve come to find less is more. Bombarding your readers with too much will discourage them from visiting your site. On the flip side, one doesn’t want to make their visitors search for information either. Great tools! Thank for sharing! You are totally right Christy! The skill is to find the right balance while making sure that people do find you and that they get a chance to interact with you online. I agree that less is more and that’s why I started the post saying that it is better to choose a couple of social media rather than trying them all..Unless you are committed to be active on all of them all the time, which is hardly possible as a solopreneur. Planning – hmm my weak point – even though I coach my clients to use it too! I’m off to look at Buffer – looks interesting. Thanks Louise! I really like Buffer and at the moment I am preparing a quick video detailing why I use it! Make sure to come back to watch it! Hi Jacs, Thank you for commenting! Yes, I tend to be very organised but it doesn’t always come naturally so I rely on lists, schedules and journals to keep me on tracks. Consistency can really make or break a business! I really want to express how impressed I am with you blog and with this amazing content you are shared with us today. I hope a lot of people will read this so I will share for sure. I love the tips,the clarity, the simplicity (a lot of people make all this too complicated). It is really tough for people to stay focused…and I sense that it might even get worse as there are more content and shiny stuff everywhere! Thank you for sharing this with The Women of Facebook! I am grateful to Jill for introducing me to this great group! Thank you for these helpful tips and reminders.It’s true that it’s hard not to get distracted by the next shiny object as new social media platforms, plug-ins, and tools are popping up every week. I too have a marketing schedule which I have to re-evaluate every few months as my business evolves. 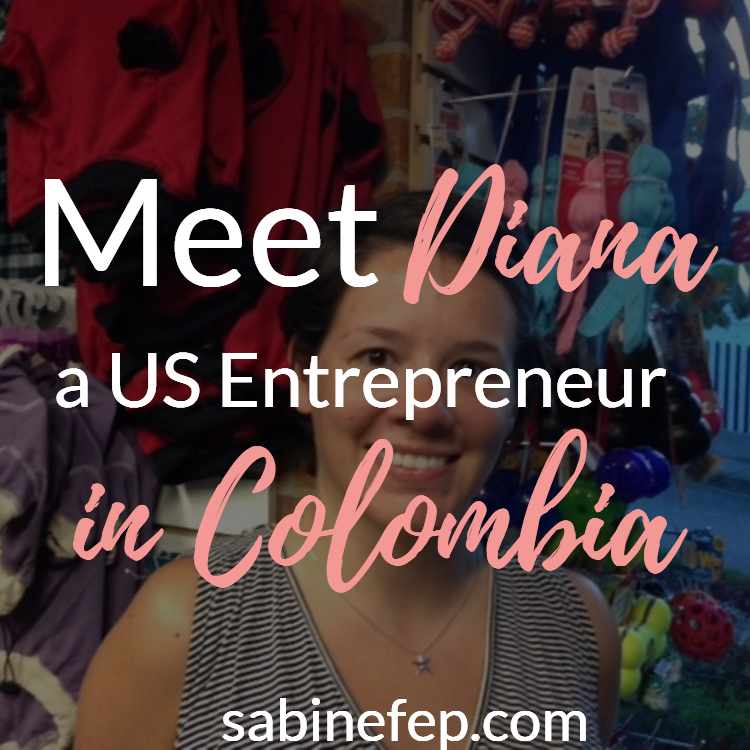 It really helps to keep me focused on my big projects and helps me to have discretion in what I actually need for my business at that point in time. Thanks Tonya. I am glad to see that you have created your own planning! It is definitely the way to go forward. A client of mine complained to me recently that she spent the past year wasting so much time online, getting distracted by some many things that she constantly felt overwhelmed and was lacking direction. I showed her how I created my schedule and since then, she has been using her own planning. She has found the focus she needed. Even though she sometimes gets distracted, as soon as she looks at it, she knows what she should concentrate on that day. Her blog is now getting new blog posts on a more regular basis and she even finds the time to create videos. The great thing about videos it is that you will get greater results (traffic) and more re-usability than a blog post. I don’t remember seeing videos on your site. Have you done videos as well?